The JSC TANECO Oil Refining and Petrochemical complex located in Nizhnekamsk, Russia has purchased AUMA’s new actuation solution for lift plug valves. The established supplier of modular, electric actuation technology supplied actuators for 28 lift plug valves to SchuF, an international industrial valve company. Commissioning is scheduled for the end of 2015. With a five-decade history, and over 40 years supplying the oil and gas sector, AUMA has strong credentials providing actuation products for the petrochemical industry. The contract was fulfilled by local subsidiary, AUMA PRIWODY. 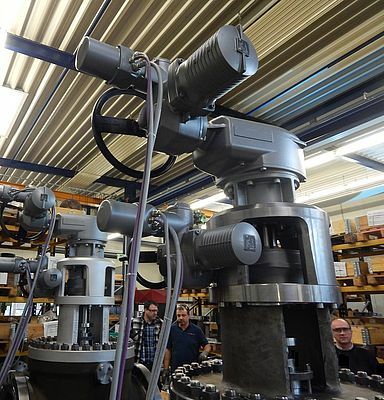 Earlier this year, the company announced its new approach for lift plug valve automation that combines two actuators to simplify operation and significantly reduce wear. As part of the JSC TANECO order, 28 SAEx .2 multi-turn actuators, combined with GK multi-turn gearboxes were supplied along with 28 SAEx .2 actuators paired with GS part-turn gearboxes. JSC TANECO is part of the Tatneft group, one of Russia’s largest oil and gas companies. Construction of the refinery complex commenced in 2005. The scheme is one of Tatneft’s largest recent projects.